For nearly forty years, Pipe-Sergeant Jack Lee has been ranked among the world’s most accomplished pipers. He has won all the top solo prizes available: The Glenfiddich Championship, Gold Medals at both Oban and Inverness, the Clasp at Inverness (2), the Silver Star at Inverness (4), the Bratach Gorm at London (3) the Open Piobaireachd at Oban (2), the Silver Star at Oban and the Masters Invitational (2). Jack teaches many piping schools and workshops each year as well as numerous private students around the world via Skype. Jack and his sons operate their business – Lee and Sons Bagpipes Ltd. They are very busy producing quality bagpipes and pipe bags. Jack recently achieved a lifetime goal of recording the entire Piobaireachd Society Collection (Books 1-16). 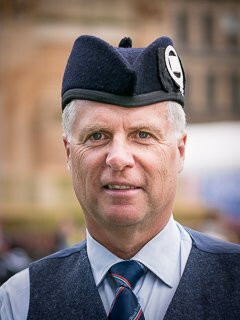 Jack has recorded over 4,000 tunes and they are available from their website – Leeandsonsbagpipes.com. Jack and Terry were both awarded honorary Doctorate Degrees from Simon Fraser University in recognition of their lifetime contributions to piping. Jack and Terry started the Simon Fraser University Pipe Band in 1980 and Jack has been the pipe sergeant throughout its existence.